Quicken Essentials is Intuit’s new personal finance tracking application and heir apparent to the Quicken throne. But, as is the case with many heirs, it’s unclear yet whether Quicken Essentials will grow to become as essential (pun intended) to your financial wellbeing as was the original. To understand Quicken Essentials, you first must understand that this version of Quicken is nothing like the Quicken for Mac that you may have come to know over the last many years. Within the first ten minutes of using Quicken Essentials, I got the impression that it is a limited desktop edition version of Intuit’s Web-based Mint personal finance application. That is going make an awful lot of people unhappy (if the comments on Rob Griffiths' first look are any indication). Quicken Essentials is missing a number of key features that will justifiably tick current Quicken users off—there’s no in-depth investment tracking, integrated bill paying, password protection, or a TurboTax export. (Intuit states that a future update will add password protection.) But Quicken Essentials is a brand new program, not just Intuit dialing in yet another version of Quicken for Mac and Quicken Essentials could be the beginning of something good. Quicken Essentials builds on the nearly correct assumption that most banking institutions offer everything you need to handle your banking basics online, such as transaction tracking and online bill-paying. Quicken Essentials is for when you need a way to aggregate that information and turn it into something useful. The program can link to and automatically download data from more than 12,000 banks. Of the three banks that I use, only one worked using my normal Web login. My second bank required a monthly fee to use Quicken Essentials’ connection method. My third bank (actually, my local credit union) exports data as CSV or QIF only, file formats that are not supported by Quicken Essentials. To track my credit union’s data, I’ll have to use the old-school method of entering each transaction manually. If you have Quicken 2007/06/05 data, Quicken Essentials will import it without a problem and several users I’ve heard from that have many year’s worth of data had great success importing data. I initially had trouble importing my Quicken 2006 file, but this appears to have been because I was saving that file in my DropBox account, which, for some reason, made it impossible for Quicken Essentials’ conversion tool to use. Once your data is in Quicken Essentials, the program’s Overview window shows a pie chart displaying your top five spending categories, a list of all your current assets and liabilities, a list of upcoming bills, and selected budgets that you’ve created. To change what you see in the main window you select any of the items that appear in the program’s source list. Quicken Essentials for Mac is a new and completely redesigned application for monitoring your personal financial information. The Tools section of the source list contains six items: Overview, Transactions, Scheduled Transactions, Last Download, Accounts Summary, and Category Explorer. All of these tools (except for Account’s Summary) display a ledger-like list of transactions. These can be filtered somewhat by using a pop-up menu to select specific accounts, but the scope of the filtering is limited. For example, you can’t use the menu to select a specific category or tag to filter your list on, instead you have to use the search field to filter your list and using that search only allows you to filter on a single tag at a time. Creating reports in Quicken Essentials is counterintuitive. There is no reports menu or other obvious tool for creating a report. Instead you have to first select the Spending Cloud report from the Reports group in the source list. You then click one of the categories that appear in the cloud, which will display a report for that category. When your report opens you select the settings menu that appears on the report. When the settings sheet opens you can fine-tune the items that appear on your report, and then press the Save Custom Report button. Quicken Essentials will then save a new report under the Reports Group. Oddly, you’re not asked to give the report a name, Quicken Essentials provides its own name based on the category you select from the Spending Cloud. You can rename the report in the source list by clicking the report name and moving your mouse away, just like you would in the Finder. With the exception of Reports and Budgets, everything else in the source list is some subset of the ledger you see when you select the Transactions item from the Tools source list. And this, in a nutshell, defines what Quicken Essentials is: A couple of graphs and a bunch of transaction lists. Which, in the end, is not much to write home about. 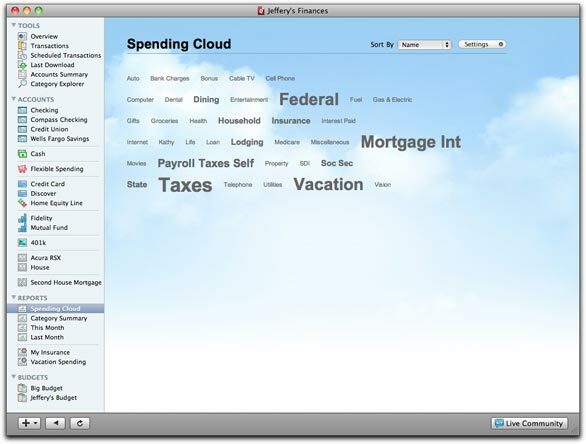 Quicken Essentials' Spending Cloud, which displays your spending categories in a cloud, is where you start creating customized reports. Quicken Essentials is a good start but it’s not yet ready to handle your personal financial information. In fact, there are at least a half dozen other applications that offer you more than Quicken Essentials at half the price. You’re better off using Intuit’s newly acquired Mint.com, which it appears to have been the template for Quicken Essentials, or you may want to stick with your current version of Quicken or choose another application. While Quicken Essentials shows some promise for the future, it’s the first time in years that Intuit has created an application for the Mac that is soup-to-nuts brand new, it’s still missing too many basic features to make it a replacement for the Quicken of old.